Picasso on Richmond - VIP Broker Event, Sky Suites Release! 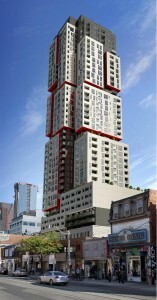 Home » Downtown Toronto Condos » Picasso on Richmond – VIP Broker Event, Sky Suites Release! Picasso on Richmond – VIP Broker Event, Sky Suites Release! Picasso on Richmond will be an urban icon in downtown Toronto, and it will create a unique living environment in the heart of the Entertainment District (318 Richmond St W). The Monarch Group and the Goldman group are two of Canada’s oldest and most prestigious builders, which have earned a reputation for delivering outstanding condos in prime sought-after locations. Experience Toronto from a different perspective – from the balcony of your exclusive Sky Suite. Rising high above the urban fabric of chic Queen West, Picasso on Richmond is a thought-provoking dedication to modern design. White volumes project from the building, seemingly hovering in mid-air. Discover the urban hotel experience in a sky-high residence you can call your own. Governor General Award-winning Teeple Architects have turned to an artistic icon, Pablo Picasso, who saw the world from a unique perspective. Picasso on Richmond will be an edgy silhouette that pushes the design envelope, while staying true to timeless classical principles. Picasso on Richmond will be a 39 storey tower, with 403 suites. Suites will range in size from a 347 sq ft studio, to a 1357 sq ft three bedroom. Suite features include 8 and 9 foot ceilings, laminate flooring, gourmet kitchens, stainless steel appliances, quartz or Caesarstone kitchen countertops, and porcelain bathroom floor tiles. The amenities (Picasso Club) will be located on the 10th floor, and will include a 24 hr concierge, fitness facilities, Yoga studio, billiards room, saunas, party lounge (with a caterer’s kitchen and bar, opening onto a private terrace with BBQ facilities, outdoor hot tub, fireplace, cabanas, and lounge chairs), media lounge, and a designer decorated guest suite. This SKY SUITE Promotion is a limited time offer! >>Click here to contact me if you are interested in attending this VIP Broker Event, or if you are interested in any other Toronto condo or loft development.